Harold Mendez’s Jaulas (2017) is a grouping of worn animal cages arranged in a circular composition. 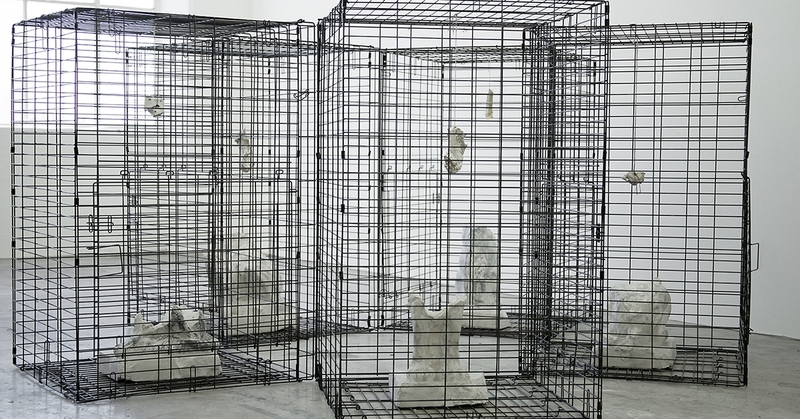 Each cage holds various fragments of stone animal statues. The sculptures have been broken and deteriorated as to leave only their bases consisting of different sets of ambiguous claws, legs and tails. Suspended above each stone base is a dangling animal bone, the sole vestige of a prey and evidence of varying narratives of conflict. What remains are violent traces of the creatures’ bodies, assemblages of the remnants of a beast or guardian. No one, apparently, has survived the quarrel. The cages face the viewer, separate yet spaced close enough so that one becomes aware that each of these animals were once witnesses too. Their conflicts have presumably all taken place within the confines of a cage, addressing questions of freedom and existence. These assemblages are the remnants of distressed beings without the allusion of survival—only struggle, chaos and impermanence.